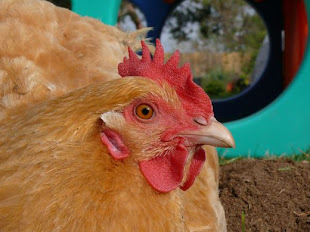 Chicken Blog: Prize, Prizes, Prizes! Where Was I? Prize, Prizes, Prizes! Where Was I? Yesterday's long, slow walk post ended rather abruptly. I was amblin' and ramblin', then I realized I wasn't where I was supposed to be, so I had to dash. I am glad people are dropping by. Nice to have the company, and nice for you to have a chance in the blogiversary drawing. Comment before Sunday night for a chance at a... uh... to get something good. I think I should name Millie Chciekenblog's greatest promoter. She has cat bloggers from around the world dropping by. I think they are here for BFTC Mc Dreamy or maybe they want to meet the Ratty-Rats... Pepper and Polly. Whichever it is... Welcome kitty bloggers. Plenty of gophers out back, help yourself to fresh water from the bird bath. Those Adirondack chairs, the yellow ones, those are available for your seating pleasure at Pannikin Coffee and Tea in Leucadia. I like the Greek Eggs, and Mexican hot chocolate. We love this fountain. We love frogs. 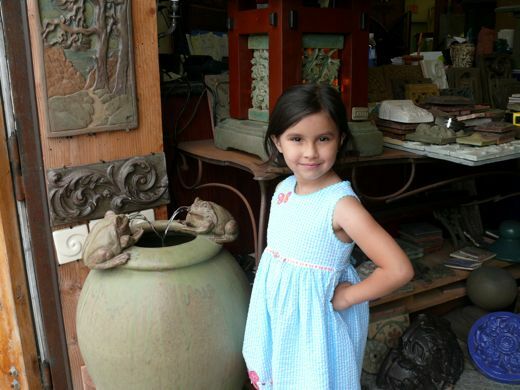 We love Builders Trading Company, where we can browse and dream while admiring all the recycled hardware, doors, and windows, and building odds and ends. I should confirm this, but I am almost certain that the frogs are the work of Laird Plumleigh. 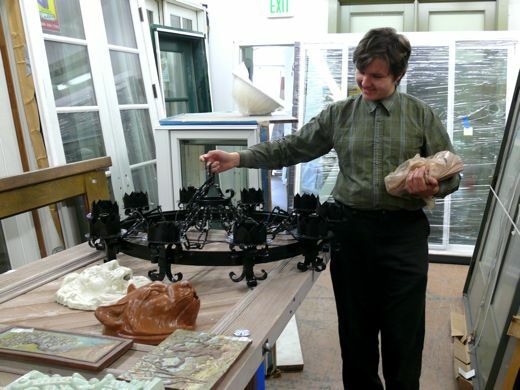 I am a quiet fan of his ceramic work, especially the Torrey Pines, and his more whimsical animals. They speak to me of a foggy California Coast, and long, slow walks. 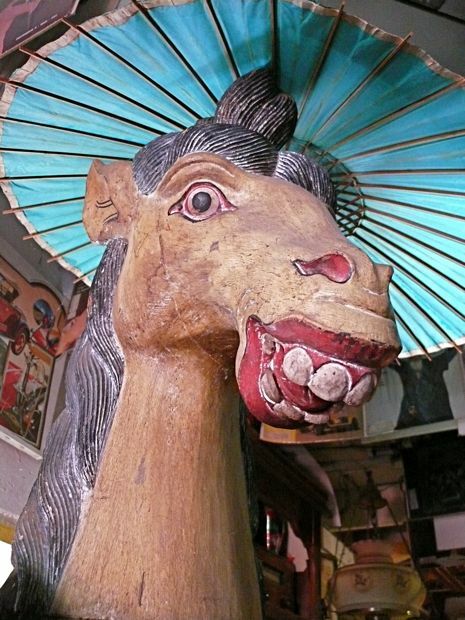 Speaking of whimsical, how about the grinning horse? It's a big wooden horse, the size you'd expect for a carousel, but I don't think that is what its purpose is. I don't know if it's for sale. I don't know what they'd charge for it. I don't know why I think I might like to work this in to my decor. So, did you see the Maker Faire badge at the bottom of yesterday's post? I was working up to explaining that we are going to the mothership of Geek Goodness and Artistic Joy. I think this is going to be like finding our people, our hearts, our Geek brothers and sisters, our Steampunk Counsins, our DIY mentors. We already know we are going to feel astounded and amazed. We already know we'll wish we came in costumes, or in six cupcakes cars. We already know we want to Steampunk-pimp our minivan ride. What other marvels await us? Will we be able to leave? Now, I have not said the word r-o-b-o-t in a long time, but I think it fair to warn you that Science Sunday, and the Art of Engineering are two Chickenblog themes that are about to enjoy ginormous growth and inspiration after Maker Faire. Robots, bicycles, windmills, painting, making, writing, computer generated graphics, video, steam boats, SteamPunk, sharing, Geeking and Making are just some of the things we want to explore... all those ideas, so many good ideas. We are ready. I've been ambin' and ramblin' again. I haven't even finished reading this post yet, and I'm laughing so hard over your welcome to the kitty bloggers. Such hospitality, with the gophers and all....You crack me up! 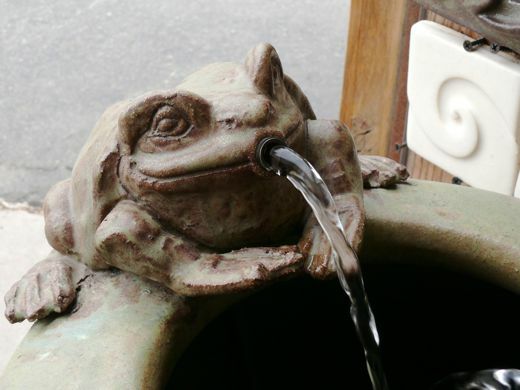 It just occurred to me...the frog fountain (or something like it) would be genius on my rain barrels! I could probably make them solar too! Thanks for the inspiration! What an idea! !I really excited to view your frog fountain.I always ready to see your new ideas. I really love that fountain concept.